Download "University College London Hospitals. 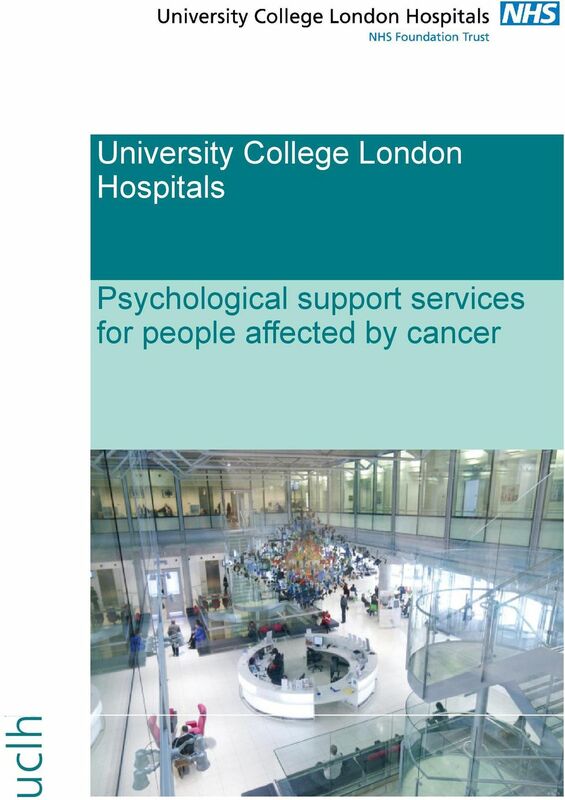 Psychological support services for people affected by cancer"
2 2 3 Introduction - the psychological impact of cancer The diagnosis and treatment of cancer can have a devastating impact on quality of life not just for the individual, but also for their family and carers. People with cancer face uncertainty, often challenging life adjustments, and may have to undergo unpleasant and sometimes debilitating treatments. As a result, psychological distress an understandable and natural response to any traumatic and threatening experience is common among people affected by cancer. Adjustment to diagnosis While each person will experience their cancer differently, common emotional responses to a diagnosis of cancer include: worry or anxiety/fear low mood or depression hopelessness and helplessness anger, guilt or irritability shock, disbelief or denial. Sometimes these feelings can persist for several weeks and start to impact on people s day-to-day lives. And it is then that some people seek help. 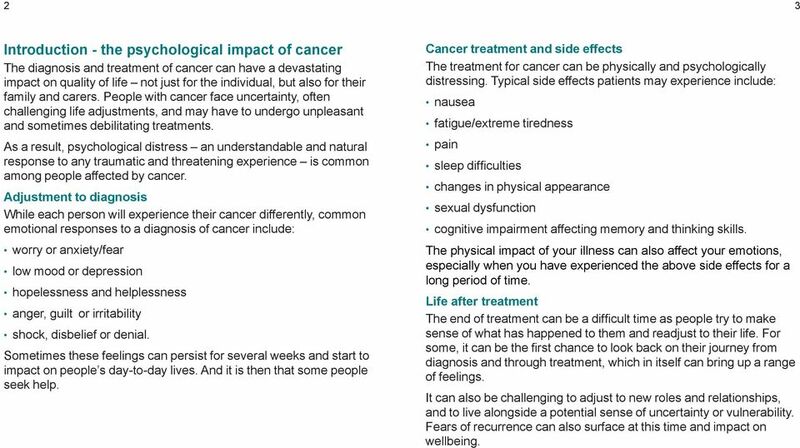 Cancer treatment and side effects The treatment for cancer can be physically and psychologically distressing. Typical side effects patients may experience include: nausea fatigue/extreme tiredness pain sleep difficulties changes in physical appearance sexual dysfunction cognitive impairment affecting memory and thinking skills. The physical impact of your illness can also affect your emotions, especially when you have experienced the above side effects for a long period of time. Life after treatment The end of treatment can be a difficult time as people try to make sense of what has happened to them and readjust to their life. For some, it can be the first chance to look back on their journey from diagnosis and through treatment, which in itself can bring up a range of feelings. It can also be challenging to adjust to new roles and relationships, and to live alongside a potential sense of uncertainty or vulnerability. Fears of recurrence can also surface at this time and impact on wellbeing. 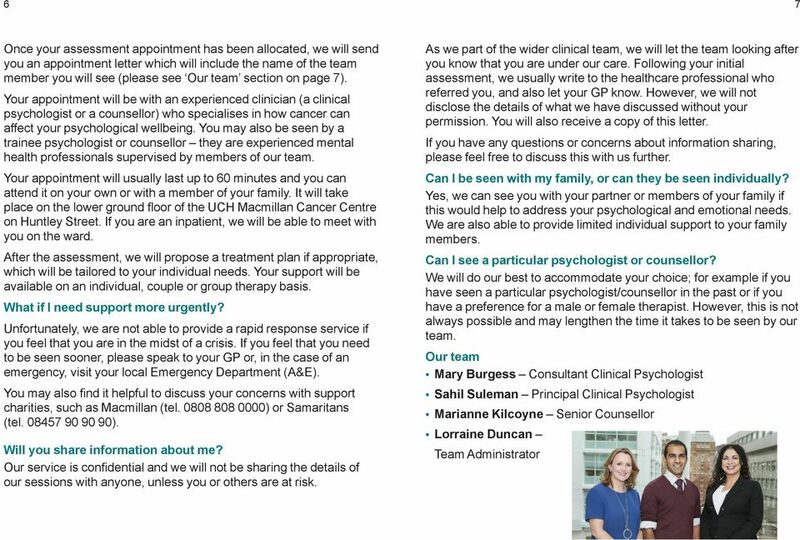 3 4 5 The general oncology psychological care team What services does the team offer? We offer the opportunity to discuss any concerns you may have. You will also be able to apply proven self-help techniques to minimise treatment side effects and enhance quality of life, both during and after treatment. We can help you with: Living with uncertainty Depression, anxiety and anger Coping with adjustment, change and loss Feeling unhappy about the way you look Coping with pain, discomfort, fatigue and treatment side effects Coping with how cancer affects your relationships and/or sexual functioning Coping with how cancer affects self-esteem and sense of self Coming to terms with possible end-of-life issues Talking to children about a cancer diagnosis Managing cognitive difficulties. Why do I need to see someone from your team? Seeing one of our team is just like seeing any other health professional in the cancer services, except that we are more focused on your psychological and emotional wellbeing. It does not mean that you are weak or mentally ill. Many of the concerns are common and are important to address. We can think together about different and effective ways of coping with your issues and concerns about having cancer. Many people who have seen a psychologist or counsellor say it is helpful to discuss their situation in confidence with someone outside of the family. How can I get to see someone from your team? 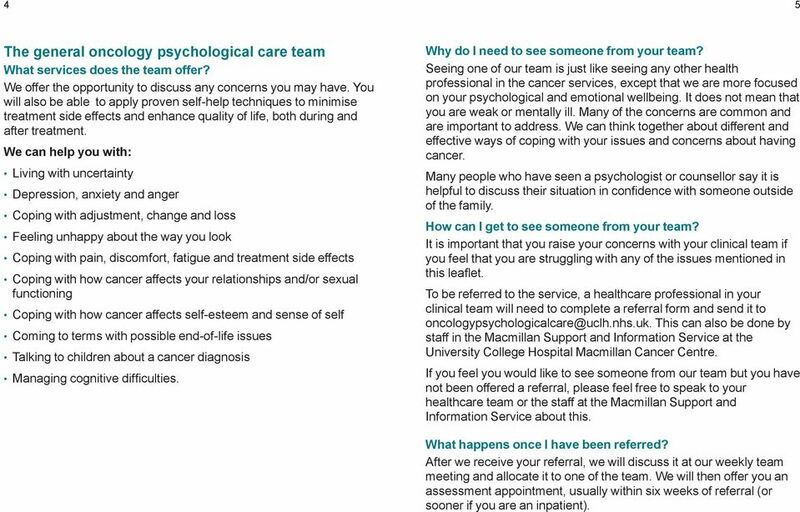 It is important that you raise your concerns with your clinical team if you feel that you are struggling with any of the issues mentioned in this leaflet. 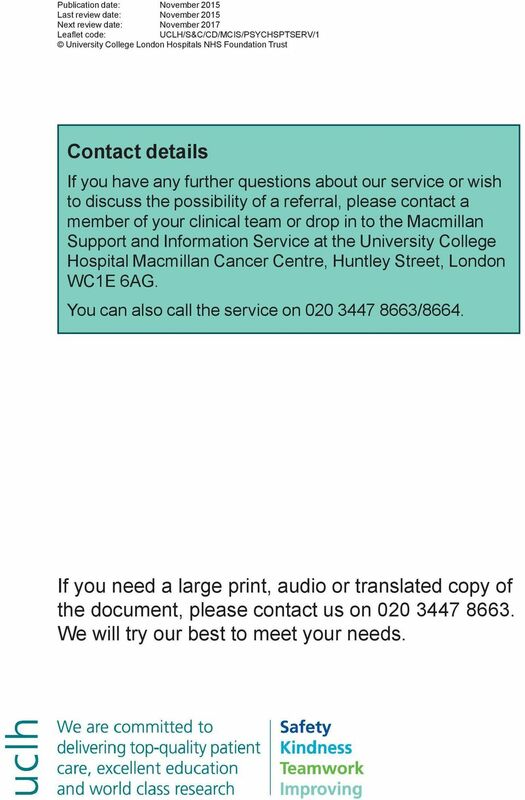 To be referred to the service, a healthcare professional in your clinical team will need to complete a referral form and send it to This can also be done by staff in the Macmillan Support and Information Service at the University College Hospital Macmillan Cancer Centre. If you feel you would like to see someone from our team but you have not been offered a referral, please feel free to speak to your healthcare team or the staff at the Macmillan Support and Information Service about this. What happens once I have been referred? After we receive your referral, we will discuss it at our weekly team meeting and allocate it to one of the team. We will then offer you an assessment appointment, usually within six weeks of referral (or sooner if you are an inpatient). 5 Publication date: November 2015 Last review date: November 2015 Next review date: November 2017 Leaflet code: UCLH/S&C/CD/MCIS/PSYCHSPTSERV/1 University College London Hospitals NHS Foundation Trust Contact details If you have any further questions about our service or wish to discuss the possibility of a referral, please contact a member of your clinical team or drop in to the Macmillan Support and Information Service at the University College Hospital Macmillan Cancer Centre, Huntley Street, London WC1E 6AG. You can also call the service on /8664. If you need a large print, audio or translated copy of the document, please contact us on We will try our best to meet your needs. Pain Clinic Psychological Service Information for patients Department of Psychological Services page 2 of 8 You have been referred to the Pain Clinic Psychological Service at the Northern General Hospital. Older Adult Mental Health Clinical Psychology Service Seeing a Clinical Psychologist Your Guide to Psychological Treatment From the WH&SCT Older Adult Clinical Psychology Team. What is a Clinical Psychologist? Atlanta Center For Positive Change Karen Kallis, M.Ed., LAPC, NCC 333 Sandy Springs Circle, Atlanta, GA 30328 An important part of the helping relationship is understanding the expectations of the relationship. PPC Worldwide Manager Resource Guide Act as if what you do makes a difference. It does. William James (1842-1910 American Philosopher) Take control of the Employee Assistance Program in your workplace. It can also be linked to someone s frustration at not being able to express themselves or perform at the level they previously expected.